For one day, in one rural community in Wisconsin, the dead returned to life. And not just to life but to their lives as well. Rather than being mindless zombies, the “revived” in the new Image Comics series REVIVAL by Tim Seeley (HACK/SLASH) and Mike Norton (Runaways, Battlepug), seem to be the same people they were before death. That impression gets put to the test when a murder is discovered and everyone - living and dead - is a suspect. With Wausau quarantined and under government surveillance after the revival and strange sightings of something otherworldly in the woods, isolation and fear will begin to take their toll on the close-knit town. Seeley and Norton, who both hail from small towns, call REVIVAL a rural noir, and for writer Seeley, it gives him an opportunity to explore another facet of the horror genre. “Revival is ... rooted in psychological horror - the fear of what happens to us when we die, the fear of not being sure if we can trust those closest to us,” he said in an April Comics Bulletin interview. The environment in REVIVAL is part of creating the tone of existential dread. Norton works with colorist Mark Englert to create barren winter landscapes, reinforcing the themes of life and death. 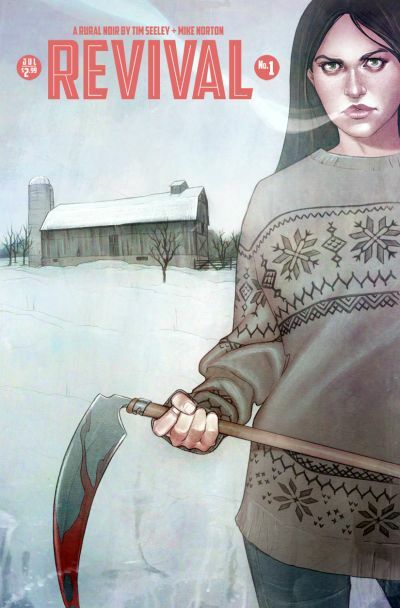 REVIVAL is a full-color, ongoing comic book series from Image Comics. Its first issue is available for pre-order in the May issue of Previews and will be in stores on July 11. REVIVAL #1 features two covers, one by Jenny Frison (MAY120495) and one by indie comics superstar Craig Thompson (Habibi, Blankets) (MAY120496). It will be supported by a promotional poster shipped to comic book retailers ahead of the series’ first issue.